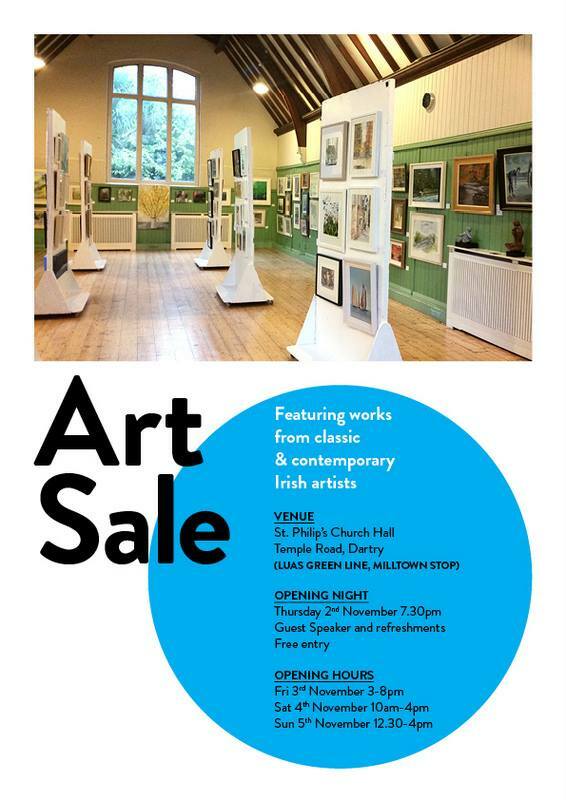 I will be showing three watercolours at the St Philip's art sale, on Temple Road in Dartry. The exhibition is opening this Thursday, 2nd November, at 7:30pm, and will run on Friday (3-8pm), Saturday (10am-4pm) and Sunday (12:30-4pm). I'm delighted to have been asked again to show paintings at this exhibition! Wish me luck! Working structurally - you'd think these ones would be easy to draw! 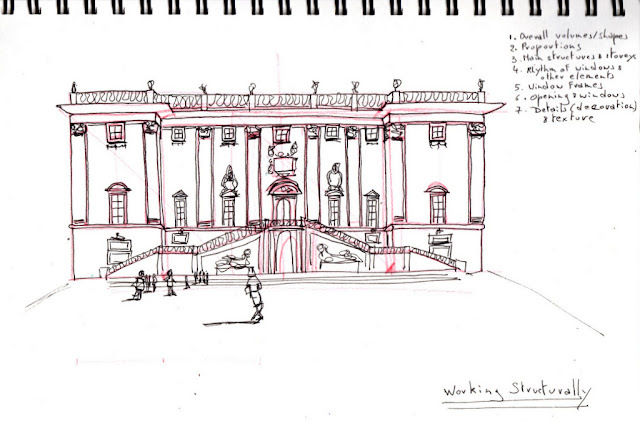 These sketches were all done from photos from the SketchingNow Buildings online course. They look easy. They are not! While I'm dithering with my current painting, I'm already thinking of the next - I don't know what it's going to be yet, but I want to play with a knife, a painting knife that is - I am not allowed near sharp objects - too clumsy, I am. Maybe I'll just do small abstracts like this one I tried in my sketchbook? I do want to move more towards an abstract feel in my landscapes. Maybe now is the time? I am a busy bee, aren't I? Even when I'm hitting a wall, I keep on working. I may not always be happy with the results, but when I look back, I feel it's certainly better than doing nothing! 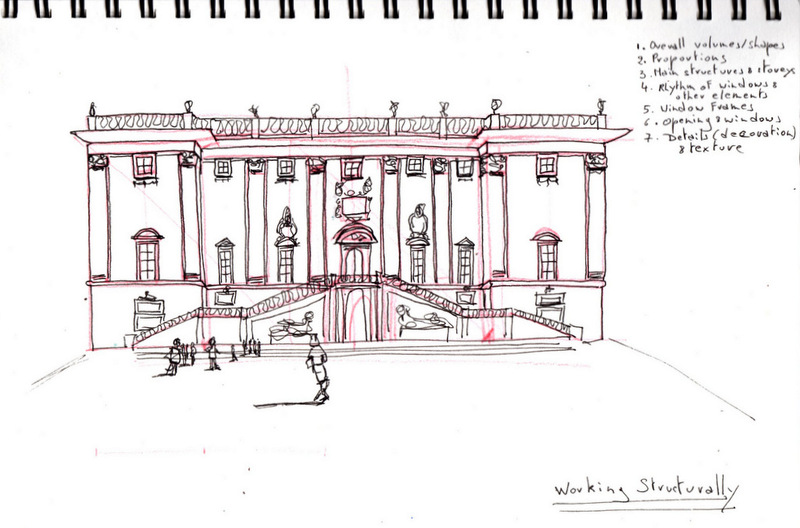 Last Sunday at Dublin Sketchers, we went to the Iveagh Gardens. I love it that we're getting towards the end of October and we're still working outdoors. It did feel cold after an hour, though. The Iveagh Gardens is definitely one of Dublin's hidden gems. It's so close to the city centre, yet, its entrance is kind of hidden. It was busy with families, young children, dogs. My memory of it was of a really really quiet place with nothing much happening - but that's over 20 years ago and during the week. 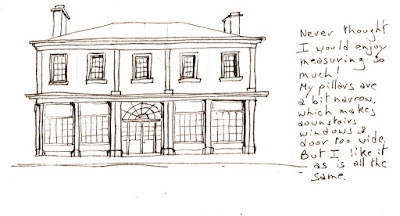 I used to go there at lunchtime when I worked at the top of Harcourt Street and I wanted to escape my colleagues. I'd say I needed to go to the bank, and I'd go and sit there for 10-15 minutes. I just wasn't that interested in chit-chat. One day, I got caught out as they came in to the park themselves. I don't think my two fellow project managers ever trusted me after that!! Ah well! Capturing views of the gardens is particularly important at present, as its future is at risk. There is a plan to build a science museum on part of its grounds, which would be a shame, as it would definitely lose its peaceful atmosphere. There is a link to a petition against this plan in the link above, so sign it if you want to be able to enjoy this oasis in the future. I was delighted to hear that my watercolour painting "Rain on the Horizon, Inis Oírr" was selected as the overall winner of the mini-competition "The Nation Paints" on RTE! If you were paying attention, you might have seen it for a few seconds behind the weather presenter on the Six One news last Sunday! It is a beautiful painting, if I may say so myself. And I was extra chuffed to be told that it was chosen by the two judges of "Painting the Nation", Una Sealy and Gabhann Dunne. What to spend my One4All voucher prize on is the next big question! Unfortunately, none of the Irish art stores are in. I'm going to have to go shopping, so!! Maybe if I write down the steps every time I sketch a scary building, it will eventually sink in! This one looked really difficult, but the rhythm of it was actually easier than the previous one. If a building has really clean, simple lines, "there's nowhere to hide"! (I didn't come up with that expression - it's something that's mentioned by Liz Steel in one of the videos!). I would like to hide behind baroque architecture for the rest of my life, but unfortunately, I'm not sure there's much of that in Ireland! Must go back to my home town for a look at Saint Loup, one of the most important Baroque churches in Belgium! Here is a couple of seasonal sketches - not done from a real skull, but from a pretty convincing plastic one! I'm in a phase of drawing with turquoise ink. Sepia would be more serious. But turquoise is definitely more me. The big worry with this storm is that the thousands of people who haven't got their electricity back since Ophelia on Monday are unlikely to have the power restored today, as it's not safe for ESB crews to be working in the current conditions. I still can't believe that this time last week (10 days ago), I was sitting outside in a t-shirt! Anyways, back to Bray, I did fit in another painting, but it will need rework, as the composition is too flat. Again, I'm very happy with my sky, but it's hard to distinguish between middle ground and foreground. I haven't had a chance to work on it in the last week, but I'll set aside a bit of time next weekend, I hope. And I did get to play with sea colour again! It would be very different today! Still a lot of flowers in bloom in Dublin's Botanic Gardens last Sunday week. I was so glad that we were sketching there - I never like to let a year go by without a visit to the Botanic Gardens, but I was cutting it fine this time. I must try and get there again before the year is out! We were just one day before ex-hurricane Ophelia hit Ireland, but you wouldn't have known. It was a lovely calm day - actually the morning was glorious, but by the time I got there it was 2pm and it was getting a bit grey. Still, I was able to finish my sketch before the drizzle turned to heavy drizzle. Mmm. I wonder does the Irish language have more words for rain than English? Anything between "It's a soft day, thank God" and "It's raining cats and dogs"? And yes, I can confirm that "il pleut comme vache qui pisse" is an actual French expression! And I had time to have a look at part of the "Sculpture in Context" exhibition, in the space above the cafeteria. Interesting that hares are a common subject for painting and sculpture, but not rabbits, don't you think? I believe my hare is thinking "does my bum look big in this?". And if you're curious as to how little drawing I do before I start to paint, here is a photo I took there. And PS: yes, I painted it all on the spot. Since colour is the most important thing for me, I try to paint on site as much as possible. I was so lucky to get tickets to Ulysses, the Dermot Bolger play adaptation of James Joyce's big book! It had everything in it, just like the book, the whole of Irish society, politics, religion, alcohol, philosophy, humour, dirty talk, scatological jokes, pathos, comedy, puppetry, singing, dancing, music. And I'm wondering if Blazes Boylan's dance was inspired by Sweets in Buffy's Once More With Feeling! I believe the current run is sold out, so you'll have to take my word for it! But if it comes back, make sure to get on-stage cabaret seats, a little uncomfortable, but right in the heart of the action! And of course, I had my sketchbook with me, and I did manage a quick sketch in the lobby of the Abbey Theatre! 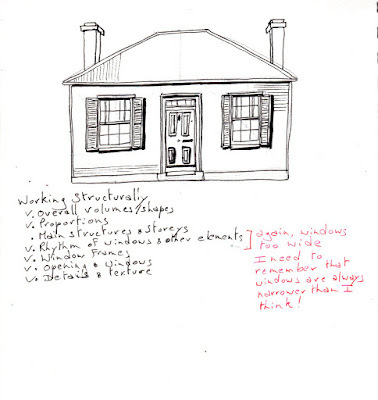 Busy these days, so not as much time to give to my #SketchingNowBuildings course. Still, I hope to keep it ticking away in the background, practising any time I get a chance. We're getting into something quite tough for me, working structurally, and measuring of course! I knew I couldn't avoid it for much longer! 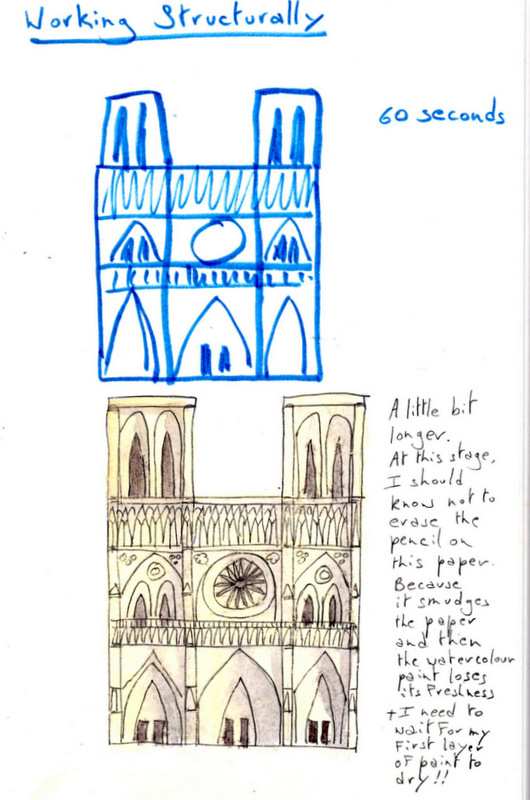 Here is my effort for the first indoor exercise, from a photo of Notre Dame in Paris. 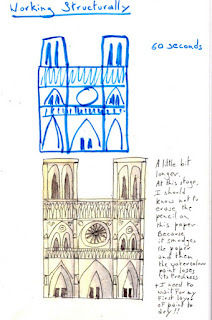 That was a great exercise, as that cathedral is seriously scary, but with good advice from Liz Steel, I felt able to tackle it! It'll be a completely different matter when I try a real face-to-face building of course! 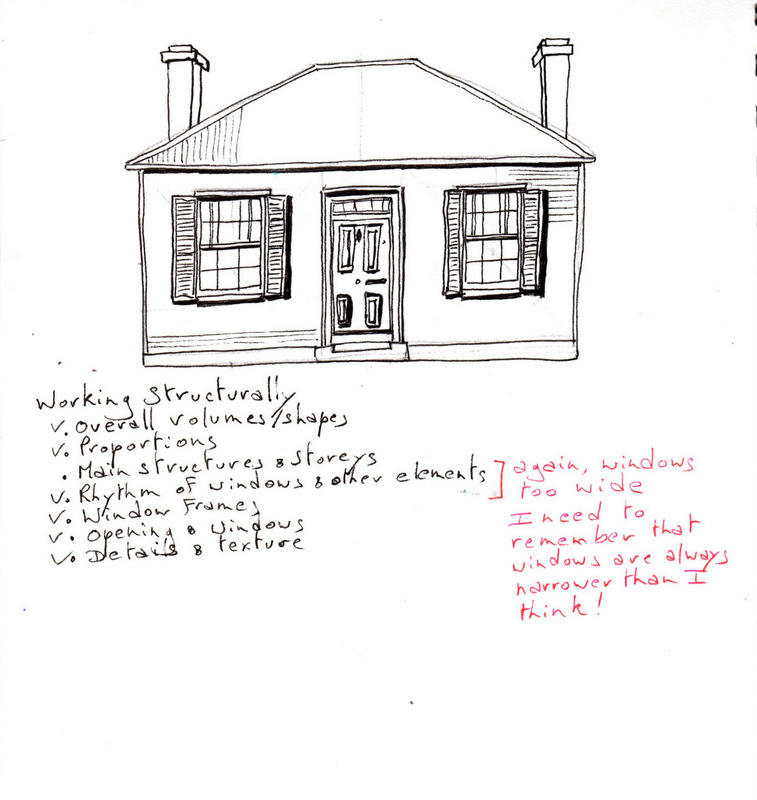 The exercise involved doing a quick sketch, in one minute, drawing the overall shape, dividing the floors, aligning the windows and doors. That was fun! Then in the second sketch, I had to follow the seven steps - but of course what I struggle with is how to figure out the general shape and proportions, step 1 and 2! My conclusion is that I need more practise! I went back over the second sketch with a grey PITT marker to accentuate the darks. Much more convincing, isn't it? While I'm well-used to urban sketching, I'm still quite new to plein air painting. 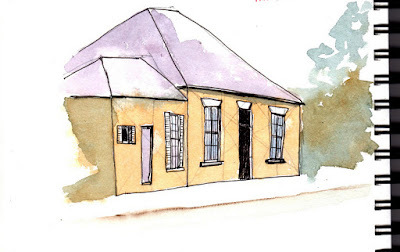 So I was delighted when a sketching friend proposed we go painting together in Bray. It's a 20-minute drive for me, with lots of easy parking. And plenty of beautiful views to paint, the harbour, the hill, the beach, the beautiful houses on the seafront and in the streets behind. On this occasion, we picked a little cove, just at the bottom of Bray head. Did you know by the way that "bray" comes from the Irish "bré", which means "hill". I didn't. Still learning something new every day. We used to often go to the Bray seafront for a walk on a Sunday afternoon. I actually used to work in Bray, a long long time ago. On the Quinsboro road (the one that goes from the main street to the Dart station and the seafront). It was handy for me at the time, as I could take the bus just outside my estate and be at work in no time. And in the evening, I would do my shopping at Quinnsworth, and take the bus home. When I got my first car, it's also where I got my first parking ticket, for parking half on a footpath. I was very upset about it! And I remember my dread every time I would drive out of Bray, going up the hill - I used to always hope the light would not turn red - it was quite a hill-start. And my car was old and had a tendency to cut out. It needed delicate use of the choke to start it in the mornings. Something I wasn't aware of when I bought it from a co-worker. It was also a left-hand drive. Not a good idea really. I couldn't believe it a couple of years later when I bought a brand new Ford Ka (it was raspberry red - I loved it!) and it was so easy to drive!! But I'm good with hill-starts now. All thanks to that hill just coming out of Bray. And also I used to live in Killiney, on the Shanganagh Road - there was hills everywhere! Back to my painting day! The weather was threatening for a while, and a cold breeze was coming in from the sea. I had my winter coat on, and a hat, and I was still frozen after an hour and half painting. Lesson learned, bring a thermos next time. Though that presents its problems too, of a bladder nature, particularly as I drink green tea, which seems to be highly diuretic! My main trouble that day wasn't the sky and the sea. I was happy with how they worked out. But the hill and the rest of the scene was too bitty. As I was looking into the light, I was just seeing a silhouette mostly, but I didn't want to paint a black outline. But I just couldn't figure out how I wanted it to look. I was getting bogged down in the detail. Over the last few days (we've been stuck at home with ex-hurricane Ophelia), I've reworked the larger painting. Thank god for the Watercolour Magic Eraser, and good-quality paper! I'm now done with it! I even gave the little man his fishing rod! It was later than forecast when the strong winds hit Dublin. As we've all stayed indoors, it hasn't felt too bad, but there are reports from all around the country of damage, power cuts in over 300,000 homes and businesses, and, sadly, three deaths so far. Here, we can't complain. We've lost one of our beautiful old trees on the green at the front of the estate. But no other damage so far. And we still have our electricity and internet. Not that it matters to Timber, who only got a short walk this morning, and is getting a bit anxious to get out again. People are staying indoors, for the most part - we saw three ladies coming home with bags of shopping earlier, but it wasn't too bad at the time. But there's been reports of emergency services being called somewhere to come to the rescue of a kite surfer who had decided it was a good idea to get out to sea this morning. Some people will never learn. By 2 pm, the wind was picking up, but nothing we haven't seen before. Lots of leaves flying everywhere. And some ladies coming back from doing a spot of shopping. About 4pm, after watching a movie, we looked out and saw that one of the trees on our estate green was down. But the sky was blue, and there was even a rainbow! The calm before the ex-hurricane! 11:20 in Dublin - wind is starting to pick up, but Ophelia hasn't arrived yet. Last night, it looked like the East coast of Ireland would also be hit, but now the forecast is not as bad here, compared to the West, where there are already thousands of houses without electricity and trees are blocking roads in Cork and Kerry. Schools are closed around the country, public transport is coming to a halt, all day procedures and appointments in hospitals have been cancelled. The worst is supposed to hit us around 1pm. So what do I do? I sketch of course! Here is the view from outside our window at about 11 - parents, children, dog owners and their doggies making the most of the morning before everyone is brought indoors. I find it hard to express in words. And photographs don't do it justice. In my 30 years in this land I love? The word I kept uttering was "gorgeous"
And I'm still wondering about the geology. I'm hitting one of those days where I feel I will never draw or paint well again. Frustrating when that happens. But I'll just have to work through it. Life is too short to go without. But I know things are not going well when I'm procrastinating. Maybe that book "The Artist's Way" would be useful after all. All my artist friends seem to have used it to work themselves out of a creative rut at some stage or other. I just don't like the spiritual aspect of it... Plus, my philosophy is that reading art- or self-motivation books is just another form of procrastination! So why am I still here on my computer, rather than at my easel? Well, I also believe in being gentle with myself. And blogging is something creative, isn't it? So, to the Custom House. I always called it the Customs House. Nobody ever corrected me. I'm in Ireland 30 years. A beautiful building. A classical building. An intimidating building. I wasn't in the right frame of mind on Sunday. But I turned up. And I sketched for about an hour. I wasn't satisfied with my work. But when I added a bit of colour to Liberty Hall and the sky after I got home, I felt better about it. Interesting that these two buildings, The Custom House and Liberty Hall, are so iconic, each in their own right. But they are rarely photographed together. But I did find one just now, from more or less the angle I was sketching from! In the end, I was glad I packed up when I did, as heavy drizzle came out of nowhere and I didn't have my rain poncho with me! Back to the cinema, for the new Met HD season of operas. I'm going to be busy this winter - lots of old and new productions! An excellent start, with Bellini's Norma. Sondra Radvanovky (soprano) and Joyce DiDonato (mezzo-soprano) as the two druid priestesses who have been seduced by a Roman soldier, Pollione, sung by tenor Joseph Calleja (he had a good voice, but I don't think he had enough charisma to make me believe that Norma, a powerful high priestess, would fall for him). So for me, it was all about the two women, the older priestess, and her apprentice, a relationship of power, but also respect and deep friendship. Sir David McVicar's production included his signature moving trees (not my favourite bit), but also a live scene change, where the whole stage smoothly moves up to reveal a completely different stage set, with singers ready to go - Apparently the Met have 5 stages that they can move back and forth, left and right and up and down. Amazing stuff! A lot has happened since I wrote that previous post about my attempts to paint the Dodder at Bushy Park. Funny how it is that I have an attachment for that spot. Or maybe an obsession? We rarely go that way these days. We now tend to park on the other side of the park, off the Templeogue road. When we first got Timber, we used to park near the junction with the road that goes to Rathfarnham (and Terenure in the other direction), and cross that little bridge over the river. Every time, the light was different. But the sides of the path by the river could on occasion be very mucky. Not good when you have an enthusiastic puppy. Mucky paws, mucky car, mucky towels, mucky house... So that's why we ended up parking on the other side. But I kept going back to that photo - it was always a scene I wanted to paint. Anyways, back to the painting - I went back and reworked my second attempt, which was so ugly I hadn't even put up a photo of it on the blog. It was even blockier than my first attempt. When I despair about a painting, I often dig out old books that I think might help me tackle a particular problem, in this case one of the books on watercolour I got ages ago, called How to Make a Watercolor Paint Itself, by Nita Engle. I remember when I tried the techniques described in the book at the time, the results were very disappointing. Just because I didn't have enough experience in order to grasp what was needed. I've learned a lot about watercolour since - how much water to use, how to use the right pigments so things don't turn to mud, how much paint to put on the brush. It makes a big difference. That's the way it is with any form of art, you're continuously learning, building your skills in a spiral (I got that from Liz Steel), with something new you've acquired every time you go around, which helps you "get" something that made no sense the previous time you travelled that path. I'm not done yet, but now there are elements I love in it. So I know I'm climbing the right mountain at least. The ugly duckling step one - and that was after lifting a lot of paint already. Step two - masking highlights and flooding the paper with lots of water and pigment, and letting watercolour do its magic. Happy with the bottom half. I need to tackle those trees next. Still need to figure out how to make the blob in the centre into a darker set of leaves. Nearly done, but this is the scary stage where I can still mess it all up! Will post the final picture when it's ready, but I'm procrastinating! I've been mulling over one of my photos of the Dodder near Bushy Park for a couple of years, and I finally decided to take the plunge and paint it in watercolours. Too blocky. But the pale blue in the centre is nice. It's Delft Blue (Schmincke) by the way. I'm aiming for a soft look, full of yummy colours and a good tonal balance. But it hasn't worked out so far - all I'm getting is blotchy and dull. Water is always a challenge for me - I find that there are so many strong contrasts and interesting reflections that I get lost in the detail and the end result is too solid. I guess I haven't really found the recipe that works for me all the time. Probably to do with the fact that I'm interested in so many things, and constantly trying out different techniques. I'm currently on my third version, and going back to using masking fluid and working very wet in wet, actually spraying water on the page to make the paint move and mingle. It will probably end up too soft. Now it's at the stage where I'm waiting for paint to dry. A lot of that goes on in watercolour painting. If it doesn't work out, I will have to move on. But I have a stubborn streak, so I haven't given up yet! You can't win them all! But you can try! I went to the Watercolour Society Exhibition in Dun Laoghaire last week. Such an inspiration! I can be fussy about what I like in watercolour. I didn't like everything. But two artists really struck a chord with me: Barbara Ellison and John Short. Such confident use of colour and line! What I've tried to do below is not a patch on her work (if you check this video from the WCSI, you will see a glimpse of her painting, and mine is really really not a patch on it, but being able to see it again will help me develop!). But I was really inspired. The two paintings below are based on a photo I took on Ini Oírr last February, with amazing light hitting the island just around dusk. In this one, it looks like a mountain was dropped on the island. But I'm happy with how the bottom part worked out. And in case you're wondering about the bright red rectangle, it's the idea of a boat. This one is still work in progress. I like my sky better, but the front of the image needs to be darker I think. Will keep you posted! Museums are free in Ireland. Which I think is wonderful. You can pop in for a quick look at your favourite painting any time you walk by. Or explore a section in depth and ignore the rest. I'm very happy to be paying taxes so anyone can discover more about art or history! Well, I want infrastructure, health and education too. Last Sunday's outing was at the National Museum, Kildare Street (Archeology). Famous for its bog bodies, gold chalices and Viking artefacts. There was a queue outside its doors at 2 o'clock, when the doors were opening. Though I didn't even get into the Museum itself. It was dry. I was well wrapped up. I found a nice little spot across the road. And I think it's such a beautiful building that I was much more interested in the architecture than its contents. It's built in the Victorian Palladian style. And apparently, its domed rotunda is based on the Pantheon in Rome. I didn't tackle the rotunda this time. 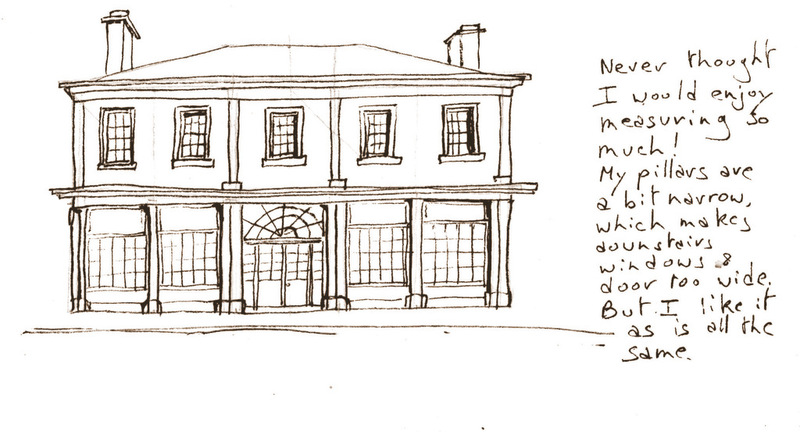 Instead, I decided to sketch a section of the outside facing the street. Oh boy, did I regret it! It's time I moved to the next lesson of SketchingNowBuildings - a whole range of tutorials dedicated to working in a structured way! Because I really need to be able to fit a whole building on a page some day! Having a passerby (a man of course) telling me I should be using a finer pen didn't help one bit. Whoever he is out there, I want him to know I am cursing him for life! Still, what I did worked out ok - I just ran out of space for the ground floor!